Dog racing is a sport run by greyhounds. The dogs chase a mechanical lure, typically an artificial bone, which is called a hare. The hare starts about half a circuit behind the start. When it passes a point near the starting traps, it automatically triggers the gate and releases the dogs. Should the dogs catch or overtake the lure, the race is declared void. Greyhounds can cover 480 meters in approximately 28 seconds, twice the speed of a human athlete. A greyhound may race at 15 months of age, but it will typically be at its best between 2 ½ and 3 ½ years of age. Although the dogs are normally docile creatures, they become very excited when they race, and there are times when a runner may turn its head aggressively on another runner. This is why the dogs wear muzzles when they race. The winner of the race is the dog whose nose first reaches the winning line. The position of the feet is not taken into account. Dog racing finishes are photographed. When the result is close, the judge examines the picture before declaring the winner. The most popular dog racing surface today is sand. At one time, grass was the norm as this was both picturesque and fast-running. However, it became too difficult and expensive to maintain in a satisfactory racing condition through the winter. 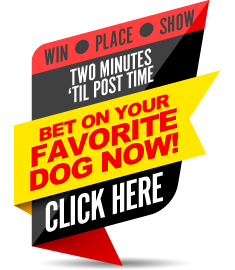 Place a bet on dog racing now. Early Speed / Front Runners. There are two types of early speed dogs. One type shows a strong break out of the box - the break call is approximately four lengths from the starting box. The other type tends to break moderately and then rush or drive the first turn. Late Speed / Closers. Late speed dogs generally show a somewhat slow break out of the box. They come to the 8th call following the pack. From here on out is where the closers run their race. Some may show a gradual gain throughout the race, while others wait until late in the race to make their move. This type of a runner pushes hard in the stretch passing many of the dogs and should never be underestimated. Class. Determining the class of the race can be tough sometimes. This can depend on the stats you have available to you. Look first to find the one showing the most "in the money" finishes at the current grade racing. Next, look for grade drops and how competitive the dog was in the higher grade. Class tends to be a much stronger variable in higher-grade races. Time. This variable brings many arguments between handicappers. Some tend to place this factor at the top of the list, while others consider this lightly. 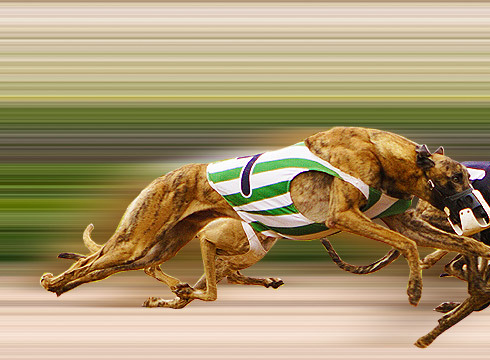 Some observers have found a strong correlation with the dogs having the fastest times generally will also be the class of the race. Heart. This factor can be gauged as seen in our stats. If a dog exhibits heart, he shows the ability and determination to come back after finding trouble. This type of competitor will either finish in the money or make a strong attempt to do so. Trouble. Trouble is the toughest variable to be found in handicapping. Coming into the first turn is where most of the trouble occurs. This is where the early speed/front runners can benefit by being out of harm’s way. The positive aspect of trouble is that it produces the higher payoffs. When selecting your key greyhound in a wager, consider his trouble percentage. If he shows a high percentage of trouble and doesn't seem to benefit by his post-position, look to another greyhound as a key. Track Preference. Knowing where a dog likes to run on the track can also be very important. Win - The first dog to cross the finish line wins. You collect only if your selection finishes first. Place - The second dog to cross the finish line places. You collect only if your selection finishes first or second. Show - The third dog to cross the finish line shows. You collect only if your selection finishes first, second or third. Daily Double - Winners of the 1st and 2nd races. Quinella - The first two dogs to cross the finish line in any order. Perfecta or Exacta - The first two dogs to cross the finish line in EXACT order. Double Quinella - The winning Quinella combinations in two consecutive races. Trifecta - The dogs finishing first, second and third place in EXACT ORDER. Superfecta - The first four dogs in their EXACT ORDER of finish. Pick 3 - Select the winner of three consecutive races. 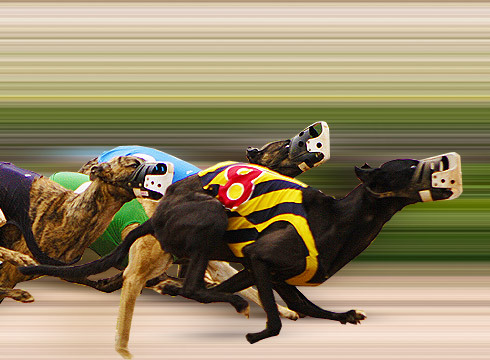 © 2003 - 2019 DogRacing.com may link to third party websites and software. We do NOT endorse, and are NOT responsible or liable for any third party content, products, or services available from such websites. Online gambling may NOT be legal in your jurisdiction. Do NOT gamble online unless you have verified that it is legal for you to do so.